The Chateau du Lude is a beautiful Renaissance chateau in the Loire Valley. It is situated to the north of the Loire valley, north-west of Tours and north-east of Angers. The Chateau du Lude is still lived in by the family who have owned it for the last 260 years. The Loire Valley in France is home to some of the finest castles and chateaux in the World and all conveniently spaced along the Loire valley making it easy to spend a few days or more visiting a selection of them. To help you plan your visit select a guide from the list of chateaux shown below. The Chateau de Villandry is famous for its gardens and in particular for its huge ornamental vegetable garden which is as beautiful as any flower garden. The castle is also open for visits but it is the gardens that attract the most visitors. The present Chateau de Chaumont is built on two former strongholds, and the total reconstruction of the old fortress occurred around 1466, by command of Bishop Pierre d'Amboise (1408-1473). The Castle, at Chaumont clearly follows a medieval plan, with its corner towers and drawbridge. It has thick walls that were topped by cannons. It is very beautiful and its charm is increased by the park and gardens surrounding the castle. The interior of the chateau contains some furnished rooms but the Chateau de Chaumont is mostly visited for its International Garden Festival. Chenonceaux itself is a small village in the Loire Valley - best known for the very popular and highly regraded chateau that stands nearby. Chenonceau Castle is magnificent, with a rectangular main body and angular towers decorated by a range of Renaissance motifs. The Chateau de Blois sits in the centre of the lovely town of Blois. It is called the Royal chateau of Blois because it was a favourite residence of 7 kings and 10 queens of France! The current Chateau de Langeais was built under the Kingdom of Louis XI, who commissioned Jean Brullé, his finance minister, with the building of the castle. The impressive work was completed in just a few years, creating a building that is stylistically unified. The visit to the castle is of great interest because it retains its 15th and 16th century tapestries and furniture. Both the interior and exterior are constructed of materials (stone and chestnut wood) that have well withstood the ravages of time. The Chateau de Chinon, not surprisingly, situated in the town of Chinon, in the Loire Valley, is made up of three separate fortresses, of which two have fallen almost completely in ruins. In fact, two fortresses, the ‘Chateau de Milieu’ and the Castle of Coudray have been partly restored. The castle of Cheverny, is located between Blois and Chambord and a few kilometres below Cheverny village, and is one of the best preserved castles in all of France - and well worth visiting both to admire the classical and Renaissance architecture of the chateau and the sumptuously furnished interior. The Chateau de Saumur sits above the lovely town of Saumur and commands some fine views over the town and river below. 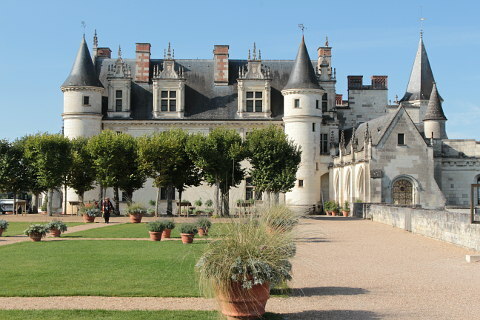 The chateau itself is not one of the best of the Loire valley but is worth a visit as part of your visit to the town. The Chateau de Chambord is located ten miles east of Blois, and four kilometres from the Loire, in countryside surrounded by woods. The Counts of Blois had originally built a palace to be used for hunting - until 1518 it belonged to the Counts of Blois, at which time Francis I decided to demolish it and build a luxurious mansion. Francis I, who delighted in this very practical exercise, could not have picked a better place to construct a castle. The Chateau d'Angers is situated in the centre of the town of Angers in the Loire Valley. It is home to the magnificent Apocalypse Tapestry. Vaux-le-Vicomte chateau is situated 50 kilometres south-east of Paris - hence it is not really a Loire Valley castle - we have included it for completeness as it is an important regional castle. It is also one of the most impressive castles in the region (indeed, in the whole of France). The Azay-le-Rideau chateau, to the south-east of Tours in the heart of the Loire Valley, is a very pretty castle standing in the calm waters of the Indre river and surrounded by parkland and open woodland. Balzac romantically described it as 'a facetted diamond set in the Indre'. The Chateau de Valencay is located a little to the south of the 'main' Loire valley, between Loches and Bourges. It is in the commune of the same name and in the Indre department of France, and is certainly one of the most attractive Renaissance castles to be found in the region. The Chateau d'Ussé is a pretty castle situated west of Azay-le-Rideau close to the River Loire over which it has very attractive views. The Chinon Forest adds further to the scenic setting. Like many of the castles of the Loire, the Chateau d'Ussé was built on the site of an earlier castle - there had already been a castle in the location since the 11th century at the time the current version was constructed in the 15th century. Sully-sur-Loire is situated to the south-east of Orleans, a little outside the region most famous for the 'Loire Valley Chateaux'. The famous castle is located inside the city, on the left bank of the Loire. The Chateau d'Amboise was one of our favourite chateaux of our recent Loire Valley trip. The chateau is beautiful; historically it has been very important and its interiors reflect this; it has stylish gardens and it is the burial site of Leonardo da Vinci!